Wn33a Graye-sur-Mer, Breche Le Bisson, K.V.U. Gruppe Courceulles. Wn33a Graye-sur-Mer, Breche Le Bisson. 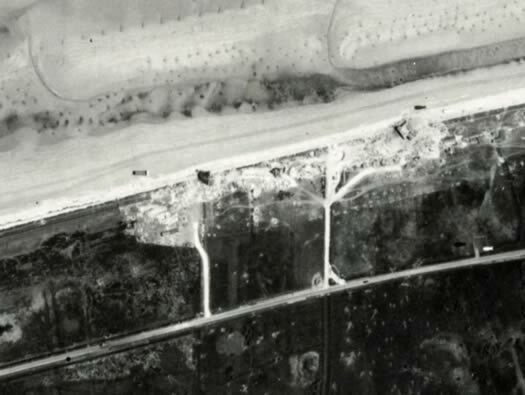 This is where a tank (Sherman) met a bunker and the tank won. 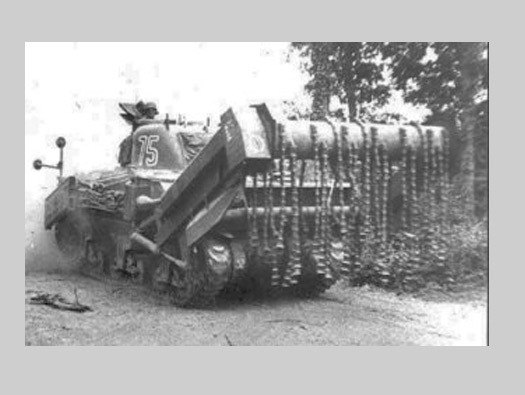 A Sherman 'Crab' flail tank. 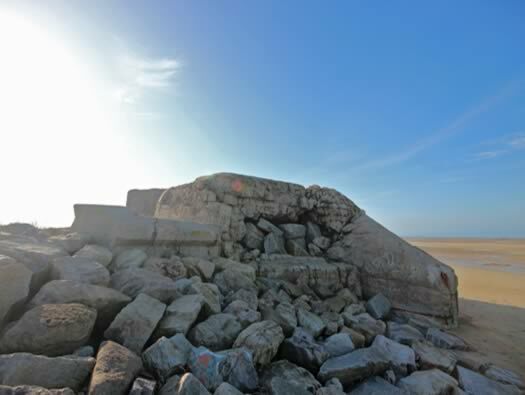 Wn33a Graye-sur-Mer is one casemate between Courseulles-sur-Mer and Ver-sur-Mer. 1 x R612 casemate (under construction). 1 x MG stand (under construction). 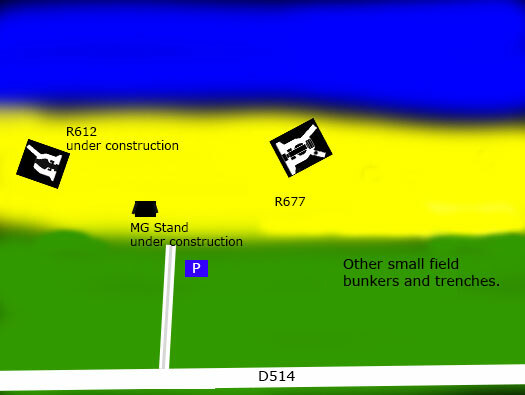 Several small field constructed bunkers. And the story of its destruction. Tank landing on Gold Beach. Wn33a Graye-sur-Mer Breche Le Bisson. Wn 33a it sits right out on its own between two very strong Wn's and it must have been over looked as a vulnerable point. 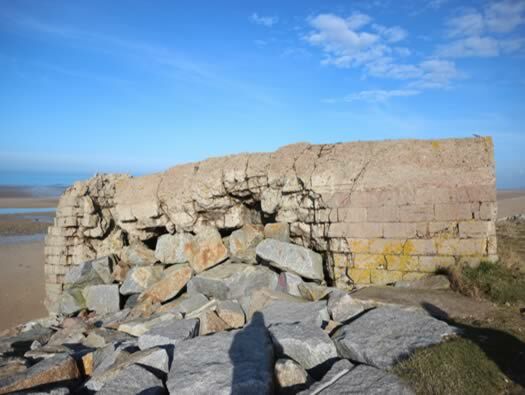 An R677 was built for an 8.8cm Pak 43/41 and possibly a field gun was set in a position back from the sea so a bunker was being constructed for it, an R612. 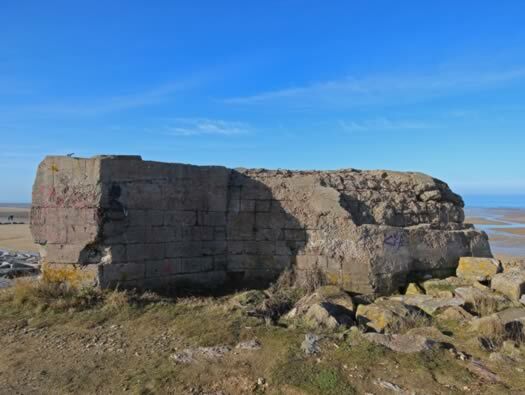 A machine gun bunker was placed between them to cover their rears. A classic Wn design using the weapons available. Gun room of an R612. A plan of the defence. 8.8cm Pak 43/41 & crew. 8.8cm Pak 43/41 in an R677. 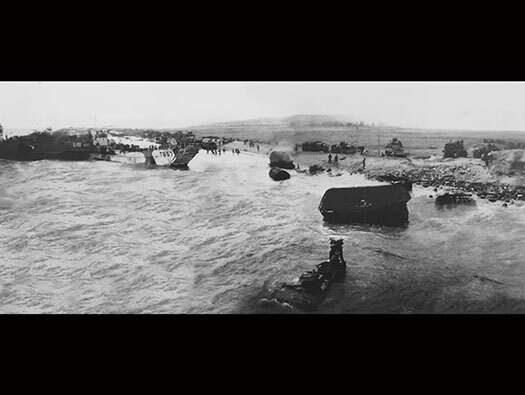 This picture was taken some time after D-day showing the beach still having a few landing craft left on the sand but most of the detritus cleared up. An R612 casemate for an assault gun probably a 7.5cm FK. An MG Shartenständ probably for a heavy older machine gun. How an R612 would have looked. 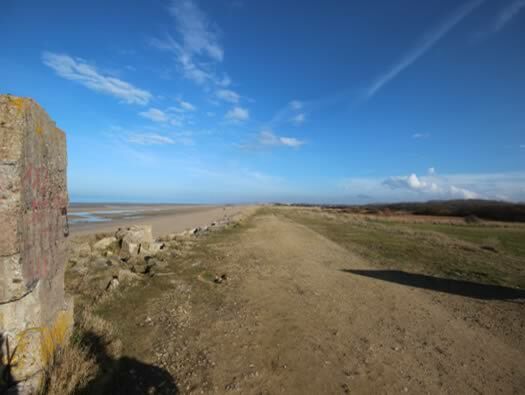 The view along the beach looking East. 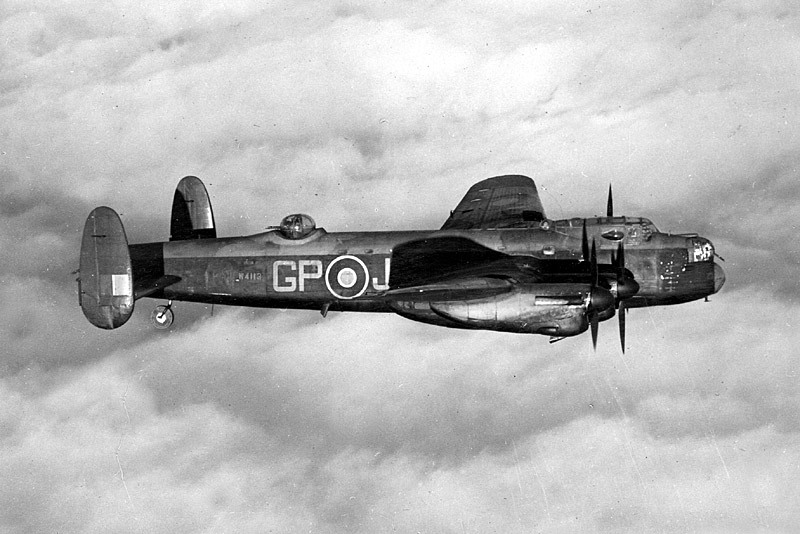 First the bombers came over, USAAF B17's or RAF heavy bombers, then medium bombers and after that fighter bombers. Next came the battleships, cruisers, destroyers. 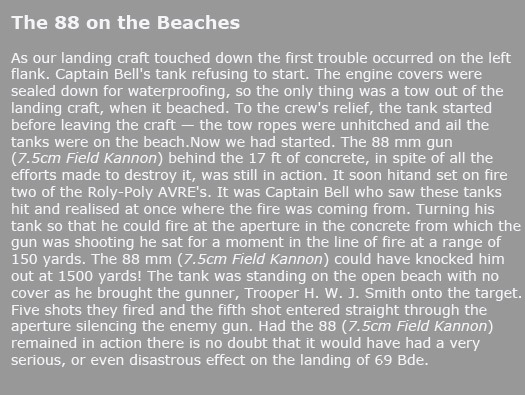 Then landing craft with hundreds of rockets and after that 105mm self propelled guns and 25 ponders fired from their landing craft. DD tanks entered the water and swam to the beach & engaged the gun positions and last but not least, the infantry. R677 plan casemate for an 8.8cm Pak 43/41gun with attached Tobruk defence. The R677 Casemate rear view into the gun room. The bunker and it looks very damaged. 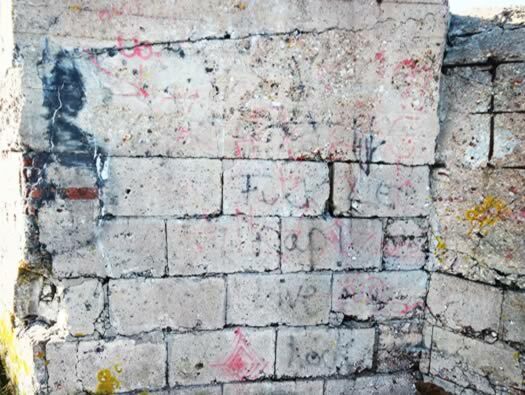 Its made in Formstein, a concrete block that locks into the next, the inner & outer walls are built and then filled with concrete to make the bunker. Gun room with an 8.8cm Pak 43/41. R677 casemate. These Formstein bunkers seem always to look worse for wear than the full concrete versions. I wonder if they were as strong as the original ones. A plan of an R677 casemate for an 8.8cm Pak with an attached Tobruk local defence. Tobruk with a machine gun defending the bunker. 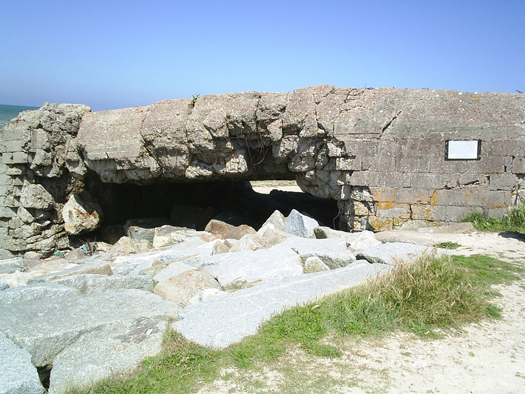 H677 Casemate Front. This is the view into the gun room, this is the view Jim would have seen. 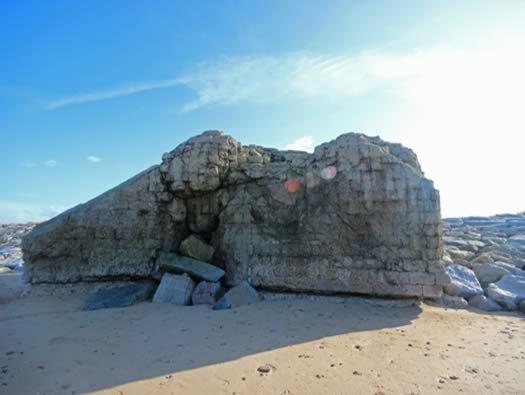 How the embrasure looked on the H677 casemate. The View from the Sea. It does look very battered. HMS Beagle bombarding the coast. An R677 gun room with two ammunition niches each side of the entrance. Jim's Bunker (David's photo). This picture was kindly sent to me by David from St Malo who visited the bunker some years ago and when the details were still on the bunker. Sadly its now gone. Churchill Roly-Poly or Bobbin tanks laying a flexible roadway across soft sand/clay on Gold beach..
Sherman 'Crab' or flail tank. Jim Smith Story Above & Below. Jim Smith in the Westminster Dragoons 1944 (from Jim's Facebook page). The tank commanders after action report.. 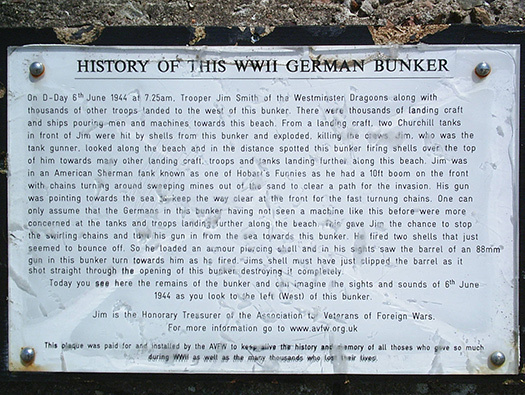 The original sign on the bunker telling its history. Jim Smith D-Day 2006 in Arromanches. The sign on the bunker 2006. 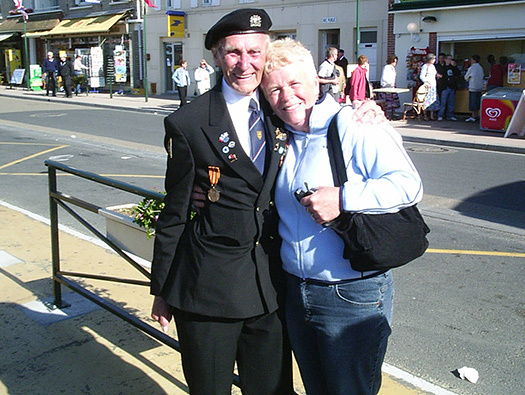 Jim Smith & Mrs Fredericks D-Day 2006 in Arromanches. The View towards where the Tanks Landed. Sherman landing from a Tank Landing Craft later on on D-day. Westminster Dragoons were the unit who transferred to flail tanks for the D-day landings and continued on into Germany. Landing Craft Tank like the one Jim came ashore on. Details of the Formstein blocks that were used to construct the later bunkers in the area. Formstein blocks and re bars. 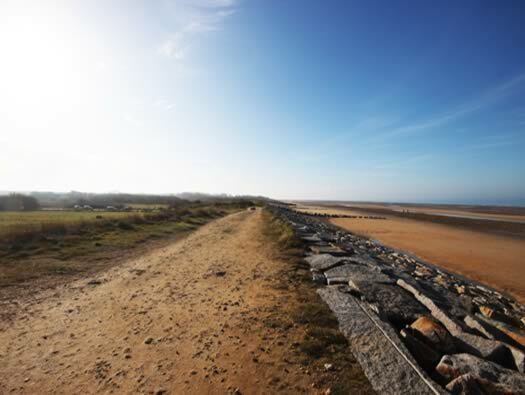 Up the Beach Towards StP Courseulles. 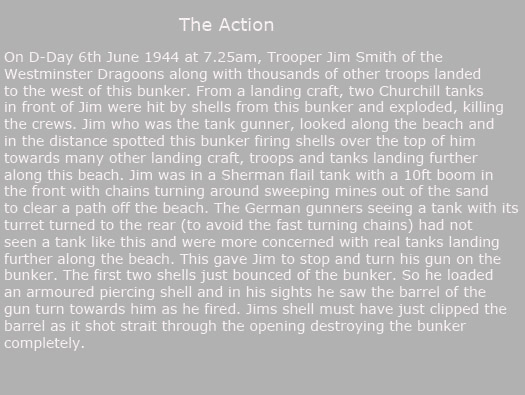 This is where Jim and his troop of modified tanks came ashore. 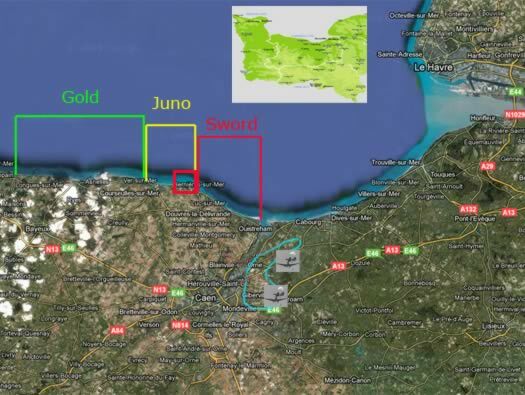 'Love', 'King', 'Jig', 'Item', the four sectors of Gold Beach . 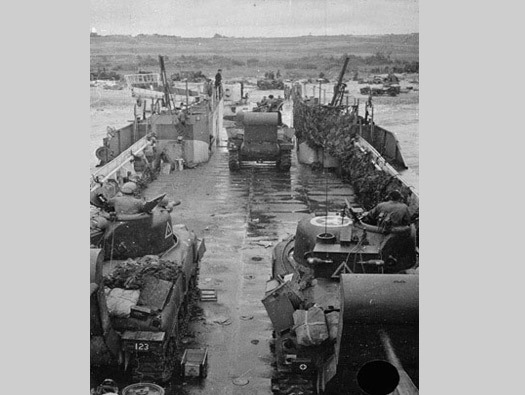 Wn33a Graye-sur-Mer Tanks Leaving an LCT. Tanks leave an LCT just as Jim's would have done not long before these tanks landed. 79th Armoured Division was formed to provide 'Funnies' tanks and vehicles for specialist jobs as in flail tanks, bridge layers, flame throwers, bridging, etc. The Westminster Dragoon Grds. were part of this Division..
Infantry working their way off the beach. Wn33a Graye-sur-Mer Sherman Flail Tank. Wn33a Graye-sur-Mer Landings now processing but not too smoothly. A DD tank still has its skirt up, US and British landing craft are struggling for space, A man is in the water and looks as though he is struggling with something. 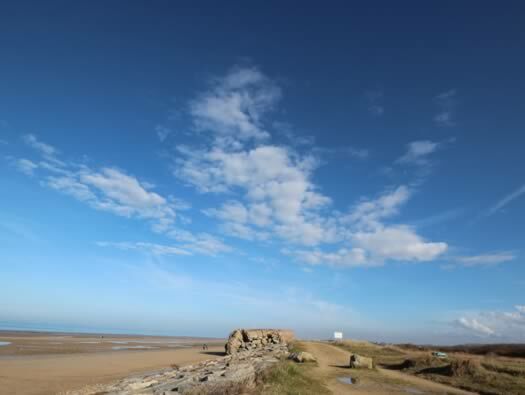 The casemate can be seen on the far right of the picture. LCT857 was built at Arrol (Alloa, Scotland, U.K.). Sub-Lt John Graham Hopetoun Vereywas the a 23 year old Commanding Officer of LCT 857 he was amongst the first to arrive on Gold Beach, G-force, Division 1 of the 33rd Flotilla. The crew had trained intensively for the running-in manoeuvre with their cargo of self-propelled 25 pounder guns firing shells as the LCT sailed under enemy fire onto the beach. 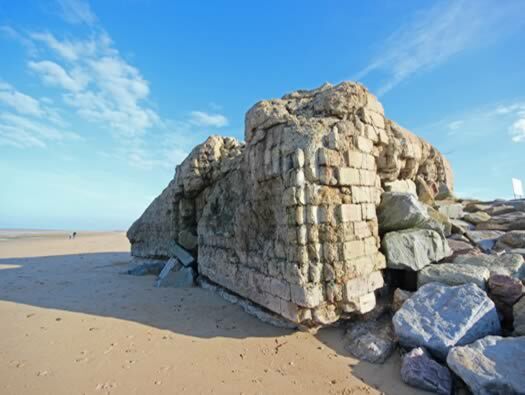 John became stranded for several hours on Gold Beach, then faced a 36 hour channel storm. USS LCI(L) 502 left the Royal Pier, Southampton with 196 officers and men of the Durham Light Infantry. At one point, close to the shore, our bow was aimed directly at a sunken truck with two wet, forlorn-looking soldiers clinging to it. At the last moment, we changed course to avoid them.